In this age of widespread spiritual indifference, a soul zealous to ascend the ladder of perfection is indeed worthy of praise. Zeal, however, must be accompanied by a profound sobriety and humility, else the soul - instead of rising to heavenly heights - will fall into a pit of vainglory, for the cunning enemy of our salvation is able to use our strengths, as well as our weaknesses, in trying to bring us to perdition. The lives of two monks, Isaac (Feb. 14) and Nikita, from the early history of the Kiev-Caves Lavra, are often cited as examples of the spiritual deception which can blind a soul whose zeal lacks the safeguards of sobriety and humility. "My son! at your age such a life will not benefit you. You would do much better to remain with the brethren. In laboring together with them you will surely gain your reward. You yourself saw how our brother Isaac was seduced by the demons in his seclusion and would have perished had he not been saved by the grace of God through the prayers of our holy fathers Anthony and Theodosius." "Never, my father," replied Nikita, "will I be deceived. I am resolved firmly to withstand the demonic temptations, and I shall pray to the man-loving God that He grant me the gift of working miracles as He did to the recluse Isaac who, to this day, continues to perform many miracles through his prayers." The abbot's wise counsel could not tame Nikita's ambitious desire to be a recluse. The monastery's elders, however, did not forsake the headstrong novice in his foolishness; they continued to keep an eye on him and to pray for him. It was not long before the recluse's cave became filled with a sweet fragrance and he heard a voice joining his in prayer. He reasoned to himself: If this were not an angel, he would not be praying with me, nor would I sense the fragrance of the Holy Spirit. The undiscerning recluse began to pray still more fervently: "Lord," he cried out, "appear to me that I might see Thee face to face!" The voice answered: "I shall send you an angel. Follow his will in everything you do." Presently a demon appeared in the guise of an angel. First he told the novice to stop praying, that he himself would pray and that the recluse was to occupy himself with reading the Old Testament, and the Old Testament alone. The unfortunate novice was obedient to the demon: he stopped praying, falsely reassured by the constant presence of the "angel" praying at his side. The Old Testament he learned by heart. The demon began telling Nikita all that was going on in the world, and on this basis the recluse began to prophesy. Laymen would come to his cave to listen to him. The monastery elders, however, noticed that the recluse never cited the New Testament, only the Old, and they understood that he had fallen into a state of prelest (spiritual deception). They broke into the cave, chased out the demon by their prayers, and dragged the recluse from his place of seclusion. No sooner was Nikita parted from the demon than he forgot all he had learned of the Old Testament; he was convinced that he had never read it. Indeed, it appeared that he had even forgotten how to read, and when he came round he had to be taught all over again, like a child. Nikita understood his error and wept bitterly in repentance. He began to struggle on the true path of humility and obedience. And the Lord, seeing his fervor, forgave him, in token of which He made Nikita a shepherd of His rational flock. 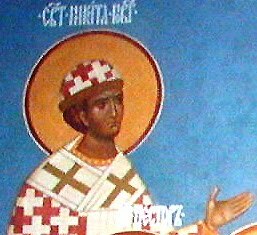 Elevated in 1096 to the episcopal throne of Great Novgorod, Nikita was granted grace to work miracles. The Lord thereby assured the faithful that their archpastor had been fully cleansed of his delusion and that his labors of repentance had found favor with God. Once, for example, during a severe drought, God answered his prayer for rain; another time, a fire in the city was extinguished by his prayers. For thirteen years St. Nikita skillfully guided his flock before leaving this world on January 30, 1108 to enter into eternal and blessed repose with the saints. St. Nikita was buried in Novgorod's St. Sophia's Cathedral which was frescoed according to plans he had designed. In 1551 the earthly remains of the holy hierarch were discovered to be incorrupt and he was officially canonized. On the eve of his glorification, a priest saw the Bishop in a dream: he was vested and censing the holy icons. When his coffin was opened, everyone was struck by the light which emanated from his face. Today his relics - encased in a large, intricately carved reliquary - are located in the church of the Holy Apostle Philip, the only church in Novgorod which remains open for worship. St. Nikita had no beard and so he is depicted on his icons. Source: Based on a translation from 1000 Years of Russian Sanctity compiled by Nun Taisia; Jordanville, 1983. That he, the Creator, may be able to see. "Appear to me, O God, O God!" That this, from God, you implore! The All-eternal One in eternity. To gaze at the Almighty. To gaze upon the eternal light. "Appear to me, O God Most High." Before him, on his knees he knelt! All occurs in its own time.